Photos by Hoang Xuan Pham. 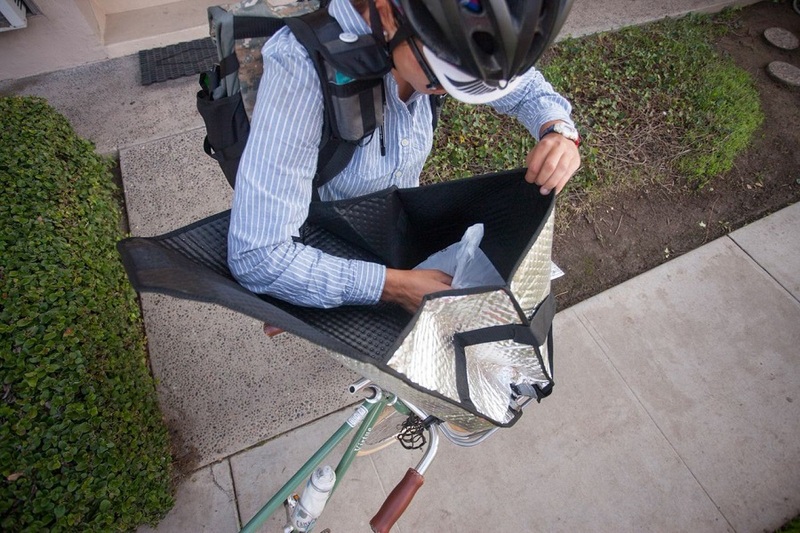 Maritime Bicycle Courier (MBC) is the missing piece to connecting the city’s jigsaw of urban, beach-side infrastructure; an answer to the question of how to deliver anything, really, in an eco-friendly manner, and to the question of how to make Long Beach more bike-friendly and responsible. It’s a movement in and of itself, that has built a community surrounding the uncompromised living of a healthy, sustainable life for anyone willing to break a little sweat or simply support those wanting to do so. 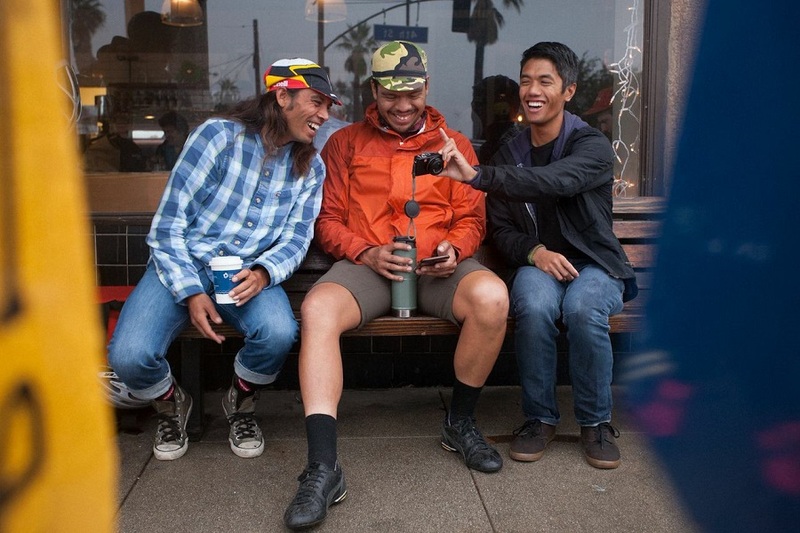 Bud Abille and Langdon Taguiped had just returned home from racing the famed Red Hook Criterium in Barcelona, Spain when the two dropped everything and took a risk, launching the business in September of last year. The two couriers, entrepreneurs and competitive cyclists have brought something to Long Beach that seems like it should have been here all along. So why hasn’t anyone in Long Beach done this before? Maritime was born from a dream to get out of the office, to combat the lethargy of coming home from a long day’s work pent up in a cubicle, to fulfill the lack of actual living and community one is unable to establish with a typical job, slouched over at a desk all day, getting lost in the glow of a computer monitor. 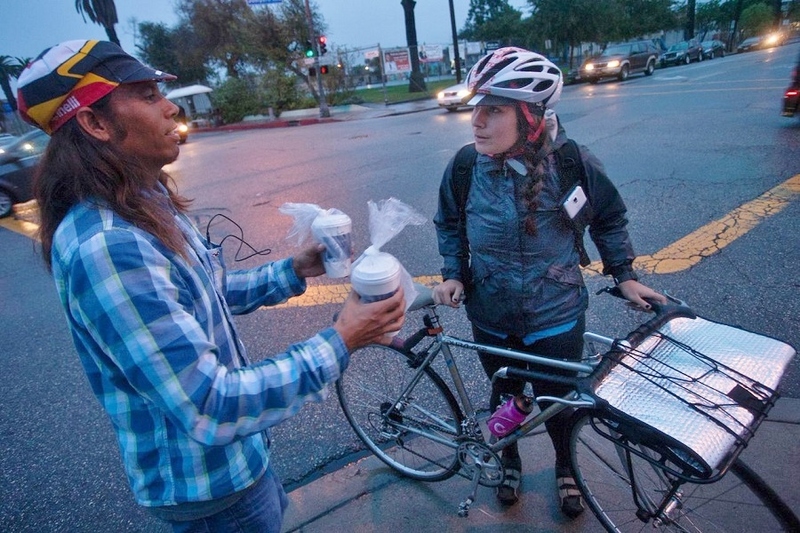 What started as a tag team operation, with Abille and Taguiped selling their services to restaurants and businesses throughout the city, has quickly grown over the past five months to a full-fledged business employing some 50 local bicycle couriers. The two entrepreneurs started recruiting from a cycling community they already knew quite well, but have altered the lives of many newcomers who had never considered making a living by bike. Abille, on the other hand, who has made riding and racing a way of life, has always known his passion for cycling would take him somewhere positive. Maritime couriers have done wonders for blossoming small businesses like Seoulmate, a Korean counter-service eatery on the corner of Park Ave. and 7th St., where Mosher’s used to be. Jason Kang, owner of Seoulmate, didn’t have to think twice before handing his budding establishment’s delivery needs over to MBC, one of the first eateries to put their trust in the company. “Our plan was to hire delivery drivers eventually, once things picked up and gained some momentum, but Bud happened to drop by right as we were about to do that,” Kang said. Maritime uses a system where to-go orders placed online to Eat24 or Grubhub are sent directly to the smartphones of the individual riders on standby. Of the seven to ten cyclists working that shift at the time, one will head directly to, say, Restauration to pick up your already-paid-for Spicy Pig Pizza and Braised Kale, and bring it to your home, office or current location rain or shine, as long as it’s within Maritime’s designated delivery zones. 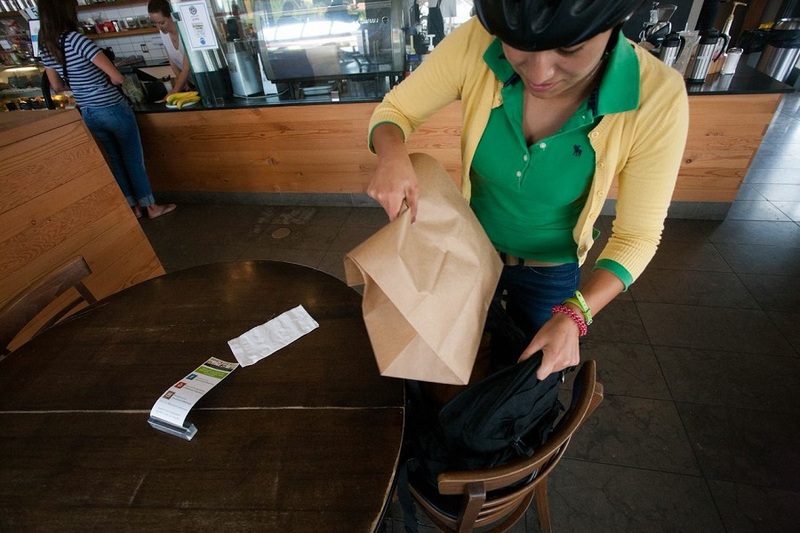 Orders can also be called into the company phone or be placed on MBC’s website for not just food, but personal deliveries of any type of goods, as long as it can fit on a bicycle. So far, nearly 20 restaurants outsource their delivery needs to MBC via Eat24 and Grubhub. Portfolio Coffeehouse, Berlin Bistro, Taco Surf, Restauration, Kafe Neo, Seoulmate and MVP’s newest location on 4th and Temple are just a few of the growing list of restaurants that have signed on to use Maritime’s services. With every delivery, the couriers are slowly but surely building a reputation for being the most eco-friendly, professional delivery service in the city. One of the reasons Rafael Larios, operator of Honduras’ Kitchen on 4th St. decided to use MBC was to reduce the restaurant’s carbon footprint and to help out a fellow small business. MBC employees make up an incredibly wide array of people, from local college and high school students to medical professionals, musicians, artists, teachers, cocktail connoisseurs, track stars, construction workers, therapists, outdoorsmen, animal rights activists, hairstylists, accountants and of course, competitive cyclists. “I worked a full 11-hour day staying completely soaked the whole shift and it was absolutely exhilarating, bringing me one of the best experiences I’ve had in a long time, to be able to provide this courier service to customers when they don’t want to leave home and get cold and wet,” he concluded. While Maritime certainly seems to attract more provincial residents, the job has also given out-of-towners an opportunity to live, work and explore a city previously unknown to them. Whitney Hall, who used to courier for a sandwich shop in Atlanta, GA, picked up everything and left for California for a major change in lifestyle. She’s now a Long Beach resident, one of MBC’s hardest working employees, has garnered an interest in potentially racing and hopes to one day lead bicycle tours across Europe. Speaking of Europe, Frenk Martucci, a visiting Italian professional cyclist, helped out the Maritime crew for the few months he resided in Southern California. Visiting with the sole intention of training in warmer weather along our somewhat glorious coastline, he introduced the Italian language and culture to the group and was able to learn a bit about Long Beach, as well. Clearly, Maritime supports a symbiotic lifestyle, connecting not just restaurants and small businesses within Long Beach, but bringing together people who would normally have never met. Maritime is a fine example of how cycling is a truly great equalizer, where those from the most drastically different walks of life can come together with just their love of riding a bike as common ground. Evelyn Delgado was able to quit her former job at Subway; Joey Helen Lloyd can continue investing in his passion for bread making; Solange Igoa, the voice of the much-lauded local band Bearcoon, can continue singing and teaching local yoga classes; Abille and Taguiped can continue to train and travel to races. 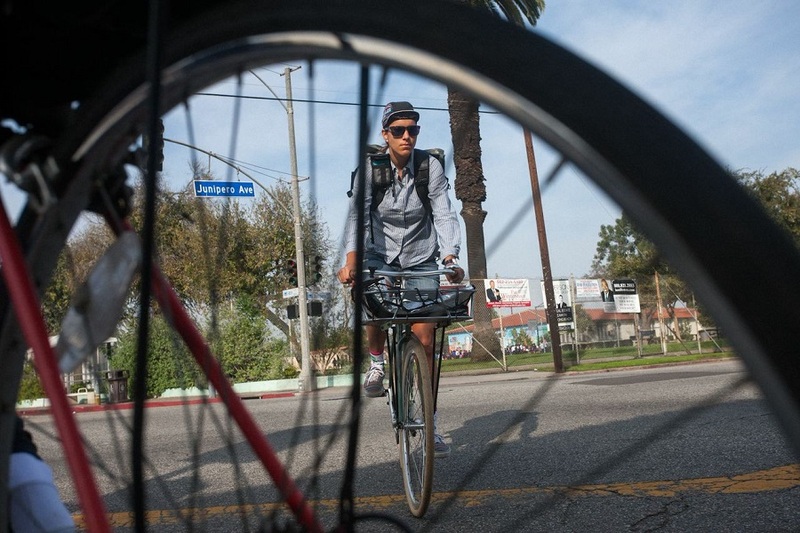 Elaina Alvarez, a soon-to-be-graduating senior at CSULB, majoring in Criminal Justice and Forensic Science, has been cycling competitively for nearly four years now. She also delivers grounds for Rose Park Roasters by bike. When presented with the opportunity to work for Maritime, it was a no-brainer. The couriers employed by MBC are not the glorified, mangy street urchins so often dramatized by the film industry, who are depicted as adrenaline junkies with no other prospects, who thrive in the face of stupid and dangerous decisions made for the sake of shaving twenty seconds off an order. They don’t revel in skirting traffic laws and angering law-abiding citizens with foolish antics. Maritime couriers are the respectable, pedaling purveyors of our “little-big” city who earnestly desire to spend their time outdoors doing what they love, including, but not limited to, cycling, making a decent living and being a part of a close-knit community. “Bikes have been a big part of my life for the past five years and I felt like, why am I wasting my time in a place that doesn’t offer any cycling or bike related classes,” Alvarez questioned. As one of MBCs first several employees, he has grown with the company to figure out that becoming a bicycle mechanic, while continuing to race, is what he really wants to do, at least for now. Now an apprentice mechanic at Outspoken in Huntington Beach, working as a courier has simply pushed him in the right direction. Hazards on the job include, and are not limited to, delivering to homebodies still in their “evening garments,” getting your bicycle stolen, finding the thief, and convincing him to sell it back to you for $20 bucks, spilling hot soup all over yourself after swerving away from an inconsiderate vehicle and getting your bungee cord, used to keep items safe and secure on your bike rack, stuck in your front wheel. It’s been a learning experience for everybody, but not without a few good laughs after the fact and the motivation to keep on rolling forward. As a courier, you’re putting yourself out into a fast-paced environment dominated by automobiles, the majority of which are being driven by people who believe you don’t belong there, sharing “their” road, even in Long Beach. Because couriers have more of an immunity to traffic and the maneuverability to make split-second decisions, whether they’re whizzing past cars stalled behind a construction site or taking a last-minute right turn, they’re able to cut a significant amount of time spent idling (and polluting the air) out of their overall route. They can choose to take side streets, alleys and the less frequently traveled shortcuts to avoid cars and poor road conditions. 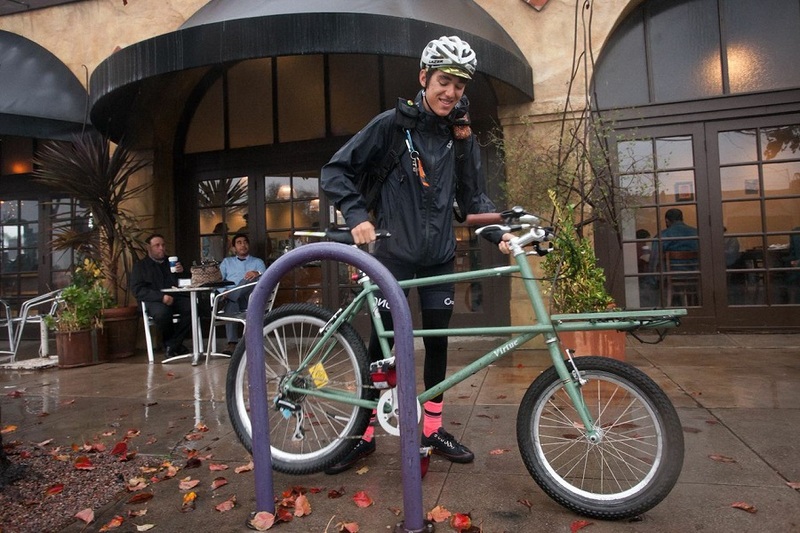 They’re the ultimate human-powered delivery vehicle, built and trained to be more efficient, resourceful and safer than a cumbersome metal cage with an engine, as they quickly learn to take full advantage of the City’s existing infrastructure, whether it’s truly bicycle friendly or not. Perhaps this growing addition of bicyclists on the streets that serve a purpose other than just riding for fun, will better bolster an understanding between motorists and cyclists alike. Evan Whitener and Nicole Maltz, co-owners of The Bicycle Stand, have been supporters of Maritime since the very beginning. The husband and wife duo had MBC deliver an order from Open Sesame on the first day they brought their son Axel home from the hospital. 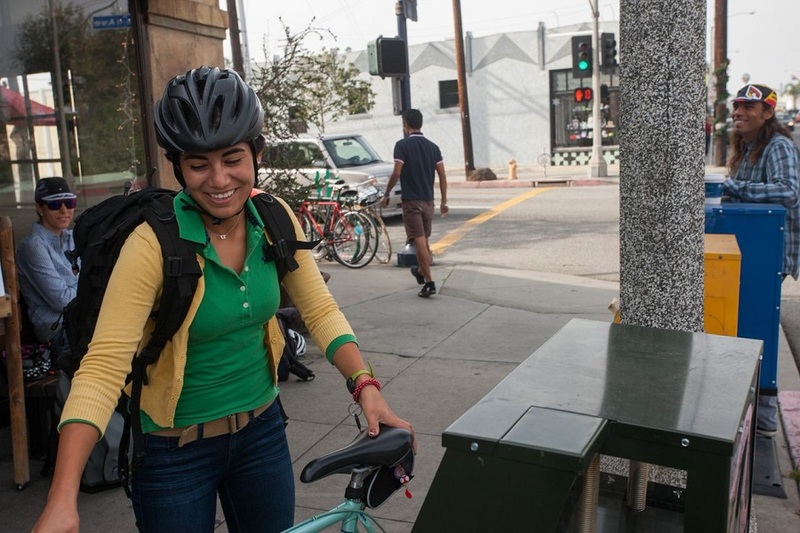 Whitener said the service was seamless and believes in the future of a courier company that can help improve cycling in Long Beach as a whole. 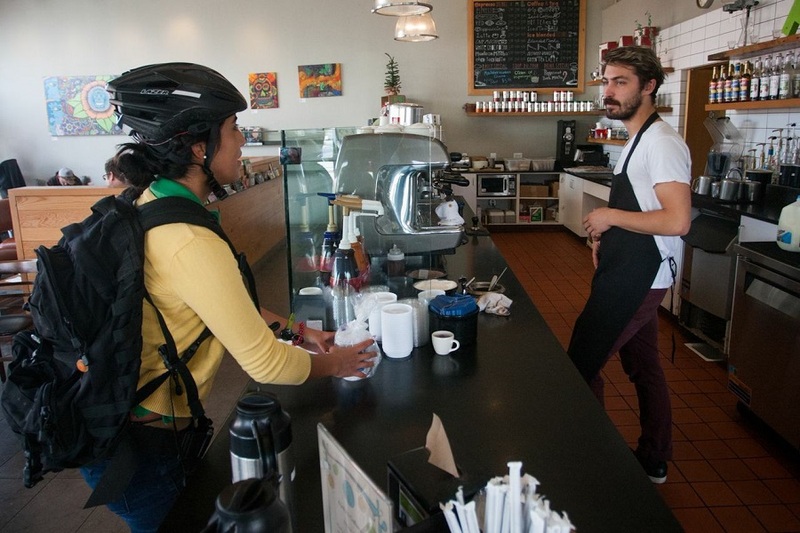 Both Abille and Taguiped, teammates, friends and now business partners, have worked countless hours to fully realize a bicycle courier service in Long Beach. Both took a risk that left them no choice but to make it work. Now, quickly, as if part of a dream, the two are just starting to see the fruits of their labor. 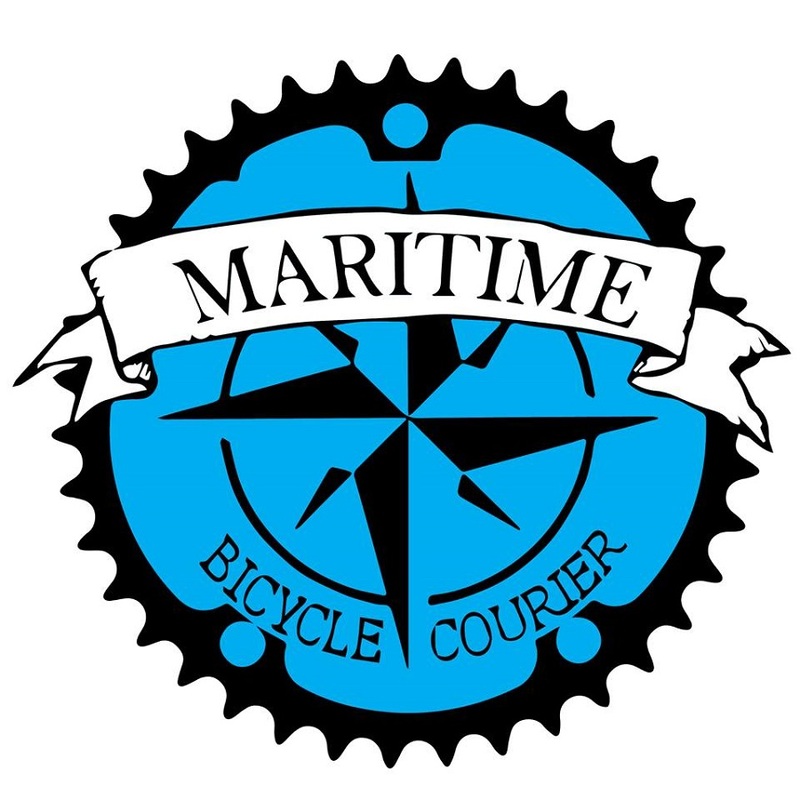 Maritime Bicycle Courier is currently accepting applications. To apply click here. For more information or to place an order, visit the website here or check out the Facebook Page here. You can follow the life of a Maritime courier on Instagram @maritimecourier.